Unbreakable - Made of indestructible, yet lightweight ABS thermoplastic. 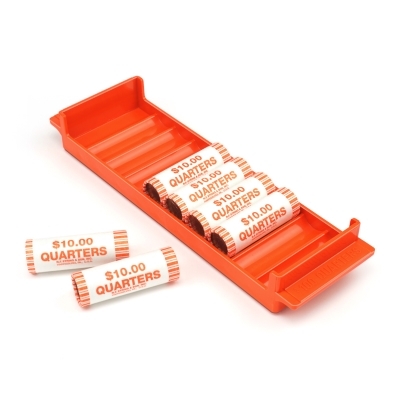 Stackable trays of same denominations interlock for secure storage. Saves time and money - color coding plus denomination and capacity marked at both ends let you take error-proof inventory at a glance. Safer, easier handling - contoured, non-slip handles at both ends. Long-lasting, indestructible trays pay for themselves again and again! Create a complete system that is versatile enough to manage all your coin handling needs, including loose coin! U.S. patent no. 3,231,074. Priced each.